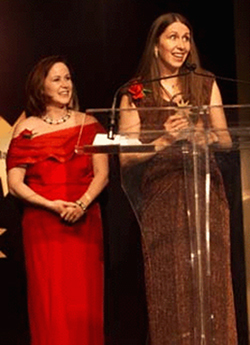 Sisters and co-founders of FabJob Inc. Catherine Goulet (in red) and Therese "Tag" Goulet accepting the TELUS e-Business Award of Distinction from the Alberta Chambers of Commerce in 2002. For years, sisters Tag and Catherine Goulet toyed with the prospect of going into business together. One day over lunch, they started throwing around ideas. "We were watching people walk by who looked stressed out and miserable, and we said, 'There's got to be something better.' That's when it clicked. Why don't we sell books to help people build their dream career?" — from the Woman's Day magazine article "Dare to Dream"
That lunch meeting happened in 1999. 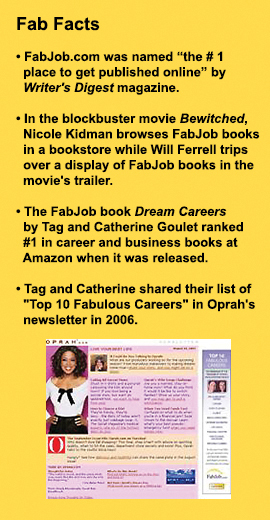 In the 20 years since then, FabJob.com has been visited by millions of people seeking a dream career. Our little Canadian Indigenous-owned family business, which we're delighted to say has an A+ rating with the Better Business Bureau, has now sold millions of dollars in career guides to hundreds of thousands of career-changers on six continents (we're still waiting for our first customer from Antarctica). Our mission is to serve fabulous people who are ready to have their dream career. But we don't try to do it all. Instead, we focus on popular careers that don't require a college degree. With a few exceptions, our FabJob guides offer advice for getting started in either a low-cost fab home business (such as event planner, interior decorator, or image consultant) or a fab brick-and-mortar business (such as a brewery, bridal salon, or spa). Each FabJob guide contains expert advice from people who have achieved success in the particular career. Experts offering inside information and advice in FabJob guides include Olympic athletes, Emmy Award winners, best-selling authors, nationally recognized business leaders, and other industry experts. An award-winning e-book industry "Internet pioneer" (as the Better Business Bureau describes us), our FabJob guides and career advice have been featured in leading media and sites including: ABC, AOL, CBS, CNN, Entrepreneur, Essence, Fast Company, Metro newspapers in Europe and New York, Microsoft’s MSN, Oprah’s newsletter, The Wall Street Journal, Woman’s Day, Woman’s World, Writer's Digest, Yahoo! and many more - even the movie Bewitched starring Nicole Kidman and Will Ferrell. Over the years, we kept hearing from readers that they loved all the information in our guides, but they wanted a way to show prospective clients and employers how much they'd learned. So, in 2013, we created a series of online certificate courses based on popular FabJob guides. The online certificate courses are offered through our new division, the International Association of Professions Career College (IAP Career College). In 2017 we launched our new company zenGOT™, a website and app connecting consumers with zenGivers™ — people who are paid to provide household services including: cleaning, decorating, dog walking, errands, event help, general assistance, handy work, home staging, organizing, party help, personal assistant work, pet sitting, yard work, and snow removal. One of the joys of being blessed with good fortune is giving back to the community. We have donated thousands of books to organizations for the unemployed, and we support independent book publishing through sponsorship of the Next Generation Indie Book Awards. For over a decade, FabJob has also funded the protection of acres of rain forest through The Rainforest Foundation and the planting of hundreds of trees through American Forests. Among the other organizations we have donated to is The Education Trust, which advocates for the high academic achievement of all students — particularly those of color or living in poverty. We offer free tuition to any Aboriginal or Indigenous person through our AMI Scholarships program at IAP Career College, and donate to Indspire, "an Indigenous-led registered charity that invests in the education of Indigenous people for the long term benefit of these individuals, their families and communities, and Canada." You can read more about some of these people, and some of our course developers and career college faculty, on the About Us page at our IAP Career College website. The benefits of providing your services through zenGOT™ include: getting more clients, finding jobs you love, making more money, having customer service provided, plus fast and easy payments for you. You can now sign up as a zenGiver in cities across Canada including: Vancouver, Calgary, Edmonton, Toronto, Winnipeg, Ottawa, Kelowna, Sunshine Coast, Brampton, Hamilton, and Mississauga. In 2019, zenGOT will be expanding across Canada and into many areas in the U.S. It's free to join so click here to go to https://www.zengot.com/become-a-zengiver and register today as a zenGiver™. zenGOT™ is a new website and app connecting consumers with people like you who provide household services for a fee. Founders Catherine and Tag Goulet have helped more than a half million people break into their dream career and start their own businesses over the past 20 years through their companies FabJob.com and IAP Career College.